Marc Calcia's property in Sorrento as seen in January 2011. The photo is part of state records on Calcia. A court order has put a Sorrento resident out of the livestock business for life after the state seized 105 animals from his farm earlier this month. Staff from the state Animal Welfare Program brought the 75 chickens, 10 ducks, 15 rabbits and five pigs to shelters for treatment after they found them in filthy conditions at a farm owned by 53-year-old Marc Calcia. Superior Court Justice Bruce Mallonee ordered the ban, saying that Calcia had violated an April 2018 deferred disposition agreement that required him to clean up the animals’ living conditions. Calcia has been issued at least 13 court summonses alleging animal cruelty since August 2017, and an agent had been inspecting Calcia’s farm on average every two weeks over the last two years, Animal Welfare Program Director Liam Hughes said. Calcia, who also contracts with the Bangor Daily News to deliver newspapers, reiterated claims made in response to the 2017 raids ― that the livestock were cared for appropriately and that assessments of the animals’ condition by various state officials were contradictory. He said he has hopes that his attorney, Jeff Toothaker of Ellsworth, can get the order reversed. “I still make feed and I still plant crops. I am still intending to farm. It is surprising that the judge did that,” Calcia said, referring to Mallonee’s lifetime ban order. Toothaker said he is asking for clarification on the order and intends to appeal it to the Maine Supreme Judicial Court once he gets it. He declined to comment further. Calcia said his wife Pam had been caring for the livestock after a doctor warned him that an injury to his left achilles tendon made contact with the animals unwise. 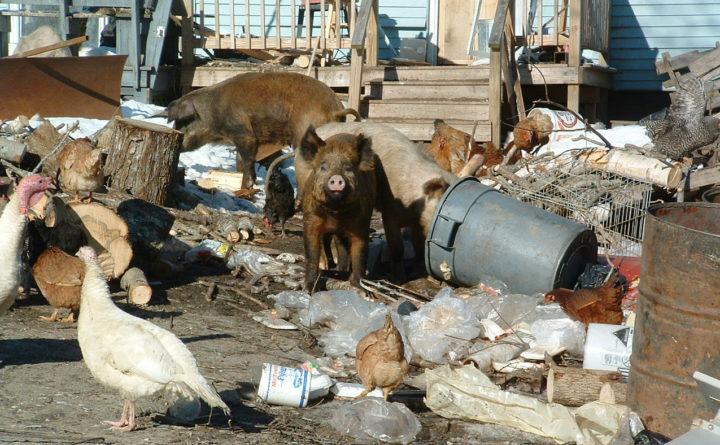 Newspaper records indicate that Calcia has owned farms in Pittsfield and Massachusetts and has had civil court troubles intermittently since 1999, including earlier state livestock seizures and allegations of running an unlicensed piggery. Mallonee’s two-page order, dated Jan. 3, followed a hearing on Dec. 7. The judge sided with animal welfare agents, agreeing that livestock conditions have not improved since the April 2018 disposition agreement. Mallonee fined Calcia $500. If Calcia does not comply with the judge’s order, he could be held in contempt of court, Mallonee said.